Growing economic inequality is a crucial factor in the rise of nationalist and populist politics in the US and elsewhere—with alarming implications for inclusive democracy and the broader human rights project. However, despite growing concern, expressed even by governments and elites, wealth inequality continued to rise in 2016, with the world’s top 1% now owning half of all global assets. According to Oxfam, eight men own as much as the poorest half of the world’s population—some 3.6 billion people. Inequality—and not just poverty and absolute deprivation—is a core development issue. In this context, do the new Sustainable Development Goals (SDGs) adopted by the UN in 2015 offer an opportunity to advance the fight against extreme inequality? The SDGs include a goal (SDG10) focused on “reducing inequalities within and between countries”, including economic disparities. The inclusion of this goal represents a groundbreaking acknowledgement from the community of states that inequality—and not just poverty and absolute deprivation—is a core development issue. Moreover, given that the SDGs are an explicitly universal agenda, SDG10 brings economic inequality in countries rich and poor under the microscope. However, there are considerable obstacles, in particular regarding the goal’s promise to tackle economic inequality and inequalities between countries. SDG10 is uniquely vulnerable to “strategic neglect”, given that it inspired so much resistance from governments throughout the negotiations and was barely mentioned in the nascent implementation plans presented in 2016. Financial commitments remain scarce, and SDG10 has no obvious thematic body or set of institutions at the international level to drive actions and funding to this goal—unlike other goals which have dedicated UN agencies, mechanisms or committees. This disconnect between commitments on the one hand, and political and financial muscle on the other is even more troubling considering that, of all the SDGs, Goal 10 will arguably require the most profound and lasting changes to the “business-as-usual” economic and development model. 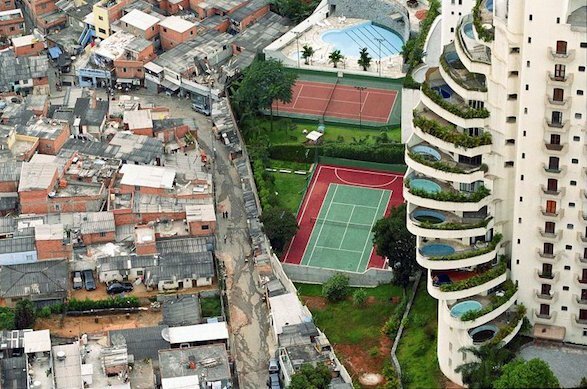 An affluent neighborhood next to a shantytown in São Paulo, Brazil. The shantytown is named Paraisópolis, which ironically means "Paradise City." As such, deploying human rights standards and tools could prove essential. First, human rights can help in defining the problem and providing a bulwark against conservative capture or co-option. There is a very real danger that SDG10 will be undermined or reinterpreted by those who are wary of the redistribution required. For example, the World Bank has staked its claim as an authoritative arbiter over SDG 10, but the Bank still shies away from attacking extreme economic inequality on its own terms. Instead, it chooses to promote the ambiguous (and less threatening) notion of “shared prosperity”. It was at the Bank’s urging that SDG target 10.1 does not focus explicitly on reducing economic disparity per se (as measured by the widely used Gini coefficient or Palma ratio), but instead concentrates on boosting the incomes of the bottom 40%. Turning a blind eye to the grotesque accumulation of wealth, income and power at the top end of the income spectrum may be more politically palatable, but it is disingenuous: top incomes drive inequality. Moreover, redistribution is an essential part of mobilizing resources to fight inequality, and any meaningful approach to economic inequality needs to take into account other inequalities and forms of discrimination (on such grounds as gender and race) that those at the bottom of the wealth and income pile consistently experience. Second, the human rights framework can provide valuable guidance on the types of policies needed to tackle economic inequality and the social inequalities it creates and reinforces. As CESR illustrates, several policy areas play an essential role in tackling economic inequality—both “pre-distributive” (setting the rules of the marketplace) and “redistributive” (distributing market outcomes in particular ways). For example, labour market policies are a crucial “pre-distributive” intervention. But, as Sergio Chaparro explains earlier in this debate, those that do not protect the rights to organize and join a trade union are strongly correlated with increasing economic inequality. Meanwhile, on the redistributive side, public services are a crucial equalizer. Oxfam has found that the poorest group in OECD countries would spend on average over three quarters of their available money just on health and education if the government did not provide them. Furthermore, the human rights to health and education have specific duties related to them designed to ensure more widespread and equal enjoyment. So, for example, services must be economically accessible to all at the point of delivery—which should, for example, put user fees and privatization under serious scrutiny. Meanwhile, in order to achieve the SDGs, most countries will need to mobilize additional revenues through taxation. Yet, tax policy has its own distributive impacts which, if regressive, can cancel out the equalizing potential of public spending. A human rights lens on taxation—in particular around non-discrimination and the obligation to mobilize maximum available resources to realize economic, social and cultural rights—can inform these policies to prioritize redistribution. Third, human rights mechanisms can offer avenues for accountability for the Goal 10 commitments. This is particularly important given the very clear weaknesses of the architecture put in place to monitor progress towards the goals, in particular the UN “High Level Political Forum”, which is designed to review national and global progress on the goals every year, but is beset by a weak mandate. Here, international human rights monitoring mechanisms could play a key role, if given the tools, mandate and financial support to do so. The 2030 Agenda Declaration confirms that the SDG commitments are rooted in human rights obligations, and the international human rights mechanisms already examine and report on countries’ performance on many of the issues covered in the SDG agenda. Given the centrality of inequality and non-discrimination to all international human rights treaties, their role in bolstering accountability for Goal 10 could be particularly valuable. This would not only add an extra procedural layer of accountability, but also a different type of accountability. It would provide a more rigorous alternative to relying on “official” SDG indicators to judge progress, given that human rights standards are in many cases more exacting, far-reaching and legally binding. Although there are many legitimate critiques of Agenda 2030, we should not lose sight of its areas of radical potential. A global goal applying to all countries that directly addresses inequalities, including economic disparities, would have been unthinkable 15 years ago. If prioritized and pursued with determination, Goal 10 could be part of a much-needed paradigm shift in how “development” is conceptualized and undertaken—towards societies in which wealth, resources and power are more evenly shared. But we should not underestimate the scale of this challenge. Frankly, a human rights approach is diametrically opposed to ideologies and policies gaining the upper hand in the US and many other countries: austerity drives that weaken state support for public services (for example, Brazil), labour and corporate deregulation, and tax policies favouring the wealthiest individuals and richest countries. This makes it all the more necessary to use this recently agreed framework of development commitments—which all countries have pledged to meet—as a foothold for advancing a human rights response to rising inequality and the political forces fuelling it.